The appearance of a Character is customizable from its Character File (.gcha) in the Character Maker. All settings are then saved to a .gcha file, which makes it easy to create various setups and load them depending on the shot. Golaem Crowd makes it possible to easily customize which props (clothes, jewels…) are available or not for the group of Entities, and even the repartition of these props. It can be useful to fine-tune the look of a group of Entities, or to match the production environment (people in winter jacket on a summer beach may not be what is expected). The props selection is done in the Rendering Types view of the Geometry Tab in the Character Maker once a Character File has been loaded. In the following example, the weights of the overcoat props have been set to 0 (except the empty one), so that nobody in the crowd will wear a jacket or a bomber. However, the t-shirt weights have been all set to 50, and the shirts ones to 0. The crowd characters will all wear a t-shirt, and it will be randomly chosen from all the available t-shirt types (with the same probability to get one or another). On top of props variations, it is also possible to setup a shader variation in order to get different textures or colors in the crowd. This is done thanks to the Shaders panel of the Geometry Tab. Shader attributes are defined in this panel and control the way the props are going to be rendered. The meaning of these values is easily understood by looking at the Hypershade. 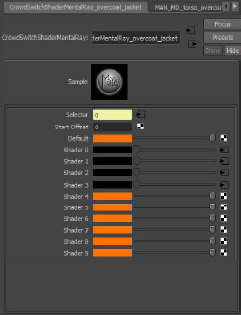 The Switch Shader takes several shaders as input and select one of them based on the value of its selector attribute. 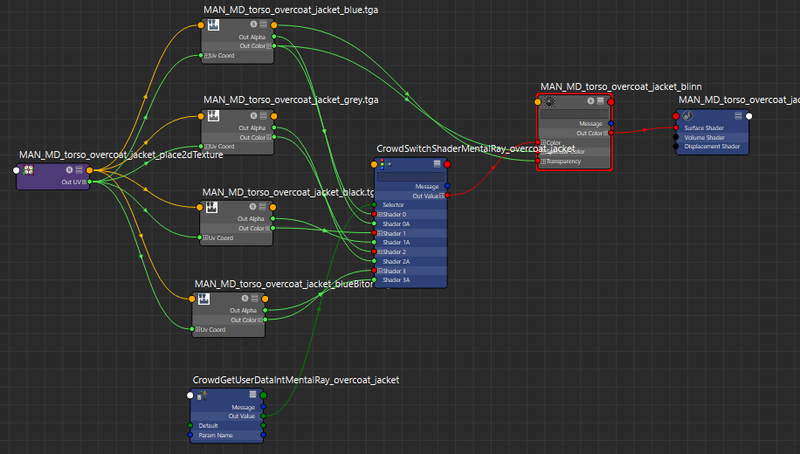 The selector attribute can be fed like here by GetUserData node, retrieving data associated to the character in the Character Maker Shaders Attributes, or by any value coming from Maya. 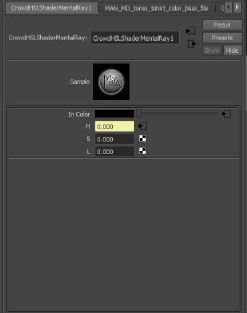 The HSLShader modifies an existing shader color based on the value given in the Character Maker. 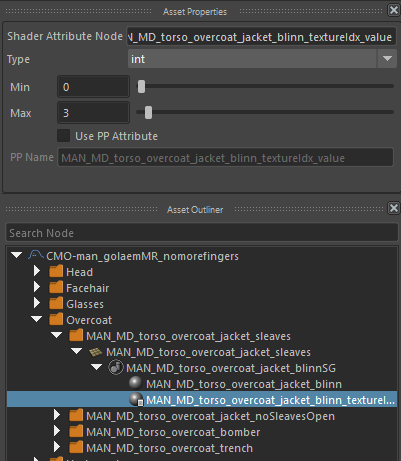 It is then possible to change the props texture or color range by adjusting shader attributes min & max values, or by plugging them to ppAttributes.